WinADay Casino players knew that once the casino’s site-wide progressive jackpot reached $150,000 it couldn’t be long before it was hit. And it was. 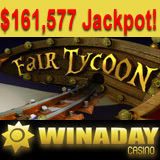 Kevin W. won $161,577 when he hit the jackpot earlier this month playing the Fair Tycoon slot game. Kevin has been a player at WinADay since shortly after the instant play casino opened 4 years ago. He said he likes to play the Fair Tycoon slot machine game once in awhile because he loves the sim city type fair-building game that’s built into it as a bonus game. His favourite games are actually Hold the Riches, Chinatown and Jackpot Jinni though. Although he wins smaller amounts quite frequently, this is obviously his biggest slots win ever. The last big jackpot win at WinADay was in May when Jody K, a young mother on maternity leave, won $171K playing Enchanted Gems. Slots, video poker, roulette and keno -- WinADayCasino has 32 one-of-a-kind casino games not available at any other casino. The progressive jackpot was re-set to $50,000 after this win and is already over $65,000 again.